Tartes famous Shape Tape concealer is a holy grail for many. I won't lie it took me a while to get on board with it but I now love it and couldn't imagine my makeup routine without it. 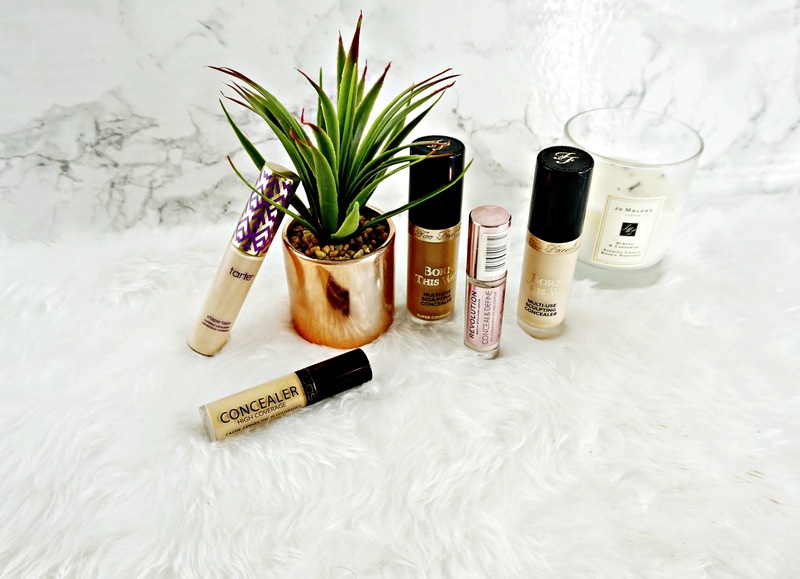 It's just the best full coverage concealer, that lasts so well and looks flawless on the skin. Other brands have cottoned on that so many people love this concealer and have launched their version of it. I've been testing them and I'm ready to report back. The beauty world literally went crazy when Makeup Revolution dropped this concealer. I mean a Shape Tape dupe that costs £5 and is so easy to get in the UK?! This super affordable offering really does give Tarte a run for its money too. It has really full coverage and the formula is so creamy and easy to blend. I find this works well under my eyes and blemishes or pigmentation. Plus there are 18 shades available which is incredible for a brand like Makeup Revolution. I will say that I do prefer the finish of Shape Tape over this though. The MUR one looks slight more dry. But for a £15 price difference I can't complain. This is the latest offering that Too Faced have launched and I think some people were a little confused because we already have a Born This Way concealer but anyway. This new offering claims to have super coverage, be hydrating, wear for 24 hr and be multi tasking. So it can be used for highlighting, contouring and covering pigmentations / blemishes. This does have amazing full coverage, it actually has a bit more coverage than Shape Tape! It makes concealing my horrendous dark circles a breeze! I have two shades, Vanilla for highlighting and Mocha for contouring. For contouring this works so well to! It's really easy to blend out and looks so natural. I wouldn't go as far as to say this is hydrating but it's not drying nor does it look dry on the skin. It wears so well to. I did notice at the end of it day it did crease a little but nothing to bad. Overall, I'm really impressed with this concealer and it's so much easier to get in the UK than Shape Tape so I do really think this is a great alternative. Plus you get 15ml of product which is half the size of most standard foundations! I had no idea GOSH where even launching this concealer but it's another great affordable one to check out. It does have full coverage as it claims, but this isn't as full as Shape Tape, still pretty full though. The formula is so creamy and easy to blend. I actually think this is the most hydrating out of the ones mentioned here. So if you have dry skin this may be for you. Although I don't think this will pose a problem if you have oily skin. It conceals everything from dark circles to blemishes. It's a great little concealer at a great price. I'm really happy that there are more concealers that are like Shape Tape. It's really difficult to get the full shade range in the UK. I think all 3 of these concealers are great alternatives but if I had to pick one it would be the Too Faced one.